I know, I know. 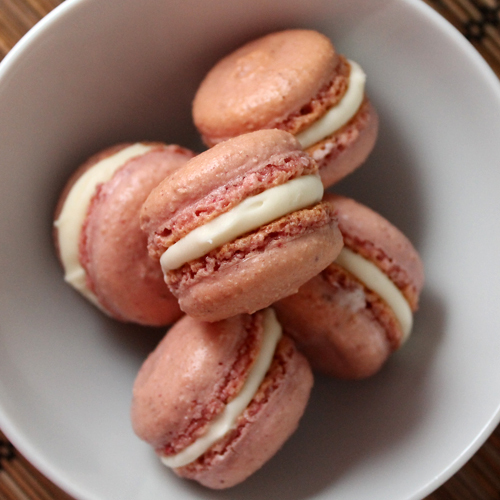 Macarons are so 2012. I should move on to whatever this years big dessert treat is! (actually, I have no idea what is supposed to be "IN" in 2013. The internet says it's fancy popcorn, figs and push-pops.) But you know what? I love macs. I think that they are cute and colorful and French, so I will go on making macarons until I run out of flavors to make! Especially now that I've found my method for macs that works consistently without all the fuss. First, I got these handy egg tools from OXO (through their blogger outreach program). OXO suggested I make myself a nice omelet, but quite frankly, I don't really go for omelets. I'm much more of a cinnamon bun for breakfast kind of girl. If I'm going to eat eggs, they are going to be scrambled and it is going to be after six pm. 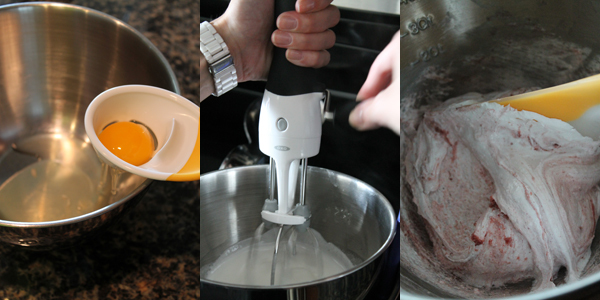 Worry not OXO, these egg tools fit perfectly for my other egg related plan - macarons! I received an egg separator - perfect for separating those whites from yolks. I also got a person powered hand mixer - just what my tired arms need for whisking sugar into egg whites over a simmering pot of water. Finally I got a fancy spatula. The tag said it was an omelet turner. 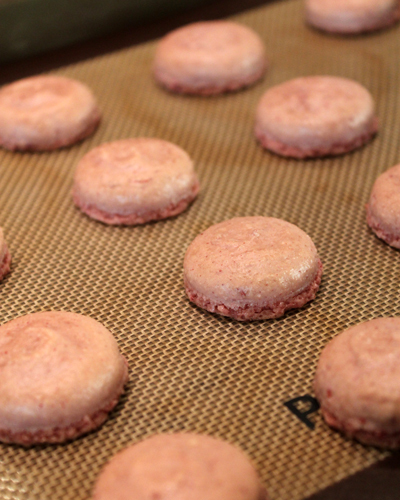 I put mine to use in the oh so important macaronage step of macaron making. These tools should be remarketed to the macaron maker. They worked perfectly! The other reason I decided to make macs? I found these freeze-dried raspberries at a gourmet grocery store in South Orange, NJ. I knew they would make an amazing ingredient to a macaron, since the best way to flavor the cookie itself is with dry ingredients. If you find freeze-dried mangos, let me know. I totally want a mango-flavored mac. How the French would sneer at a mango macaron! So now we have raspberry and white chocolate macarons, OXO has a new marketing campaign for their egg tools and my pantry is cleared of two of the more eccentric items. All in all, a good day! See, so cute. So colorful. Bonjour macarons. 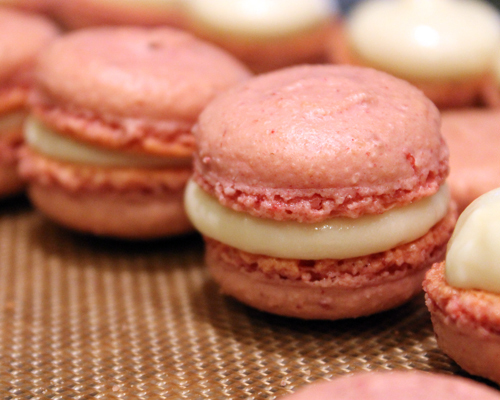 I used freeze-dried raspberries to flavor these macaron shells. 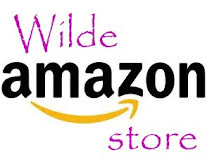 You can find freeze-dried fruits at gourmet grocery stores or sometimes at hiking stores. Toss them in the food processor and process them until they are finely ground. I used about half of my bag of dried berries for the recipe. 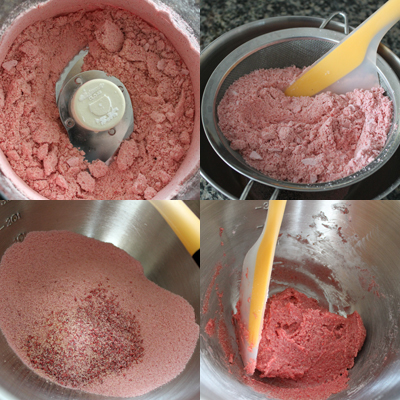 You can also use the powder to flavor rice crispy treats! 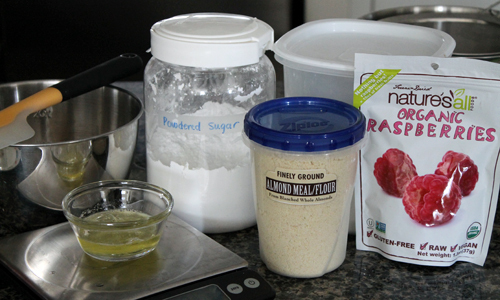 Combine almond flour, confectioner's sugar, powdered raspberries and food coloring in the bowl of a food processor. Whir for about 1 minute, until everything is combined. Sift mixture through a medium sieve to break up the large pieces. Just toss anything that remains in the sieve into the bowl with the sieved stuff. Stir the dry mixture with 50 g egg whites and set aside. Bring a 4-quart pot of water to a simmer. In a medium bowl, start whisking 50 g of egg whites until they start to get foamy. Add granulated sugar in three portions, continuing to to whisk. Once all of the sugar is added, place the bowl over the simmering water (make sure the bowl doesn't sit in the water, but is a few inches above). Whip the eggs until they reach stiff peak and are shiny and glossy white. The meringue should be warm to the touch, but not hot. If it starts to get too warm, but isn't yet at stiff peak, remove from the heat and continue whipping. Add meringue to the almond flour mixture and begin folding it into the almond flour mixture. Be sure to turn the bowl to combine all the ingredients together. It will take between 30-40 turns to get to the desired consistency. It should flow like cooling lava, or, if you draw a line down the center of the batter with your spatula, it should disappear within ten seconds. Transfer batter to a piping bag with a 1/4-inch tip. Line two baking sheets with parchment paper or silpats. Pipe out 2-inch circles of batter, leaving an inch in between each circle. Allow the newly piped shells to dry for 30 minutes before baking. Preheat oven to 300 F and bake shells for 15 minutes, rotating halfway during the baking. 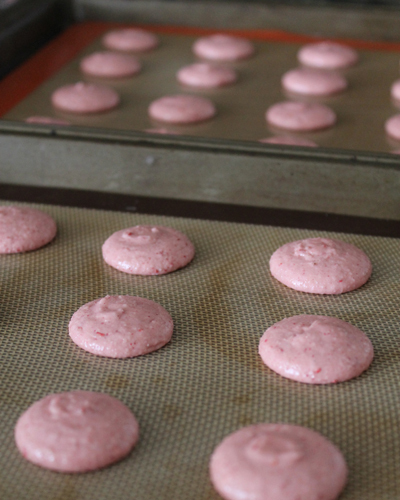 Once finished baking, remove macarons from the oven and immediately transfer the parchment paper/silpat off of the baking sheet. Place macarons on a wire rack and allow them to cool completely before filling. I decided that there is nothing better with raspberries than white chocolate, although I'm wishing this buttercream was lemon and white chocolate. Although that may have been dangerous, as I would have eaten the entire batch of macarons before I could get them to the office. In a medium bowl, beat butter for about 1 minute, until light and fluffy. Add heavy cream and beat until combined. Add white chocolate and vanilla and beat until smooth. Add powdered sugar in two portions, being sure that the sugar is completely incorporated. Beat until your frosting reaches your desired consistency. Disclaimer - I received the OXO utensils (omelet turner, egg separator & hand mixer) as a part of the blogger outreach program. The opinions within this post are my own.